"20MPH Zones and Speed Humps Do Not Work"
Following the recent release of road casualty data for 2011 from the Department for Transport (DfT), a fresh row has erupted between road safety campaigners and drivers' groups over whether traffic calming measures are really effective at reducing casualties. A keen Full Fact reader pointed out that the Association of British Drivers (ABD) was among the detractors, arguing that 20mph zones and speed humps simply do not work. The ABD point to Portsmouth as an example of the failure of 20 mph zones as a road safety measure. Portsmouth introduced a city-wide 20 mph speed limit over 2007 and 2008 - the first council to convert all of its 30 mph residential roads to 20 mph limits. "20 mph limits are areas where the speed limit has been reduced to 20 mph but there are no physical measures to reduce vehicle speeds within the areas." "20 mph zones use traffic calming measures to reduce the adverse impact of motor vehicles on built up areas." While this distinction may seem minor, research actually treats the two types of scheme separately in order to evaluate which is more effective at reducing road casualties. "Campaigners invariably use examples of narrow, hazardous residential streets where they claim 20 limits will be wonderful. Indeed, we have no quarrel with 20 limits or even lower on such roads, the problem is the use of blanket limits. Just try driving on some of the wide boulevards with houses set well back from the road at 20mph where these limits will also apply and see how unrealistic and pointless this will be." Portsmouth's scheme is an example of this 'blanket' limit in the ABD's eyes given its comprehensive operation. So what does the evidence say about the success of these schemes? The ABD use the latest DfT road casualty data to fuel their argument against Portsmouth's limits. They note that, between 2010 and 2011, casualties resulting in death or serious injury rose from 91 to 143 - an increase of 57 per cent. The national average rise was just two per cent. While it's not clear why Portsmouth's case is such an outlier for 2011, this alone certainly isn't evidence that the city's 20 mph limits are to blame. Fortunately, more comprehensive studies are available. In 2010 Consultancy firm Atkins released a report with the Department for Transport which aimed to evaluate the implementation of Porstmouth's 20 mph limits. The report's release was greeted with a frenzy of media reports, with the Telegraph and the Mail reporting that "20 mph limit has not made roads safer" while Ross Lydall from the Evening Standard read it differently, arguing it showed that 20 mph limits do work. The report also found that the number of casualties overall actually fell by 22 per cent. However it also concluded that overall, improvements in casulaty rates were not demonstrably greater than the national trend, and that 20 mph zones were more effective at reducing average traffic speeds. "The design of the report is very bad... they haven't got a control group, which is pretty basic, and without which it is pretty naive to jump to conclusions." While Portsmouth can't yet tell us anything useful, there has been no shortage of studies on 20 mph limits and zones more generally. On limits - the Transport Research Laboratory conducted a study for the DfT in 1998 which brought together a series of findings from local authorities and international case studies of traffic calming measures abroad. It found that the use of speed limit signs alone only had a small effect on the mean average speed, by around 1-2 mph, whereas more extensive traffic calming measures such as speed cameras produced greater speed reductions. There was also no reduction in injury accidents, apart from one example in Austria (which was said to have used a large publicity campaign alongside the signs anyway). 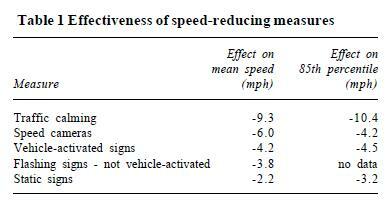 However there is good evidence available on the positive impacts of full 20 mph zones. The British Medical Journal (BMJ) published a study looking at the effect of such schemes in London from 1986 to 2006. "The introduction of 20 mph zones was associated with a 41.9% (95% confidence interval 36.0% to 47.8%) reduction in road casualties, after adjustment for underlying time trends. The percentage reduction was greatest in younger children and greater for the category of killed or seriously injured casualties than for minor injuries. There was no evidence of casualty migration to areas adjacent to 20 mph zones, where casualties also fell slightly by an average of 8.0% (4.4% to 11.5%)." "20 mph zones are effective measures for reducing road injuries and deaths." The findings echoed another study from the Transport Research Laboratory from 1996, looking at the UK as a whole with similar methods to the 1998 related study. The BMJ authors admit however that police recorded data are prone to underestimation when it comes to road casualties. They also indicated that 20 mph zones may actually reduce the severity of injuries more than the frequency of collisions, owing to slower vehicle speeds. There is considerable evidence to support the view that 20 mph zones do reduce road casualties. Some of the more comprehensive findings actually suggest the effect is better at lessening the severity of accidents rather than the frequency with which they happen - possibly owing to reduced vehicle speeds. The ABD's inital quote should properly be read as referring to 20 mph limits, which are less comprehensive than zones and do not include many of the physical traffic calming infrastructure otherwise present in zones. The evidence on this is more mixed and few tangible benefits have been reported in various studies into the schemes. It is difficult to reach any sound conclusions on the basis of Portsmouth's case alone. The argument over what form traffic calming should take - such as whether speed humps are a good thing - is another debate entirely. That there are casualty benefits when 20 mph zones are brought into action is well backed-up by the evidence. How dangerous are young drivers? How many child deaths are avoidable? Are tens of thousands dying from work every year? Is it more dangerous to be a pedestrian than a cyclist? Do a quarter of young drivers crash in their first six months? Are cyclists to blame for road accidents?